At Net-Commish its all about running YOUR fantasy league YOUR way. We bend over backwards to help you customize our fantasy football site to meet your league stringent requirements. We have NO ANNOYING AD BANNNERS or SPAM ROBOTS. Options such as logo customization (with a database of over a thousand helmets), team commentary, message boards, chatrooms, scoring versatility and the latest FLASH LIVE UPDATES allow it to be everything you want in interactivity. With over 20 modifiable layout options to choose from, no where else you will get the custom-ability that Net-Commish has to offer. 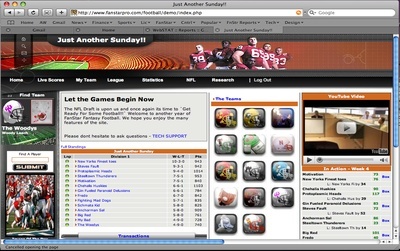 Net-Commish.com again delivers 50+ new features in 2005 which make it easier than ever to setup and run your league. LIVE STATS and SCORES, EASE OF USE, and FAST, RELIABLE TECH SUPPORT are staples of what has made Net-Commish.com what it is today! and too many more to mention! !